This meditation on the twelve Improperia, or Reproaches – a ceremony of the Good Friday Liturgy - was made by Prof. Plinio in one talk. TIA has broken it into three parts to make it easier for our readers to follow. This is Part III. Information about what the Reproaches are as well as advice regarding the spiritual advantages for us in meditating on them can be found in the introduction of Part I (click here). And you have beaten Me with blows and scourges. The manna from heaven was a very exquisite food that had many delicate flavors. A person could eat as much as he wanted of it without ever becoming full. It fell from the sky abundantly and fortified the Hebrew people during their march through the desert. The people only had to gather it from the ground where it had fallen; no one had to make any other effort for it. The manna was a symbol of the Holy Eucharist, which has all the exquisite flavors desired by each soul. It opens our spiritual appetite to receive more graces and it is there endlessly for us to enjoy. It brings abundant graces to fortify us for our earthly pilgrimage. No one has to work to have it, for it comes to us by the merits of Our Redeemer. "And you have beaten Me with blows and scourges..."
How do we repay Our Benefactor for this priceless gift? We repay Him with blows and scourges. What do the blows and scourges refer to here? They are the rejections we make when Holy Mother Church asks us to fulfill our Catholic duty. She asks us to defend the Faith denied by so many people; she asks us to uphold her Morals that are being flouted by all kinds of criminal actions; she asks us to preserve her Liturgy that is being profaned; she asks us to uphold her Exegesis that is being corrupted. In short, she asks us to defend all of her Tradition that is being destroyed by Progressivism. When she reminds us that our duty as Catholics is to defend her, we often turn our backs on her as if to say: “That is not my concern. I have other things to do.” This kind of answer is not only an act of egoism and cowardice, but a blow to the face of Our Lord. 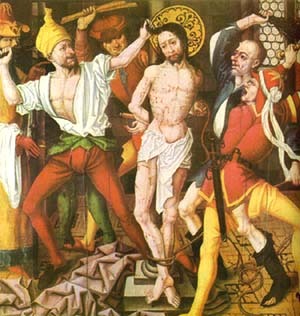 It is a scourge of the whip on His back on His Way of the Cross. Let us pray to Our Lady, who was always faithful to everything God asked of her, to give us the courage to face our duty, accept it and accomplish it so that we may be a consolation for Our Lord in His Passion, and not the cause of more blows to His Face and scourges on His Back. And you have given Me gall and vinegar. When the Hebrew people were thirsty in the desert, Moses touched a stone and water miraculously sprang from it. Instead of being grateful for this miracle, the Jewish people gave Our Lord vinegar and gall to drink when He thirsted on the Cross. The application to our spiritual life is the same as our commentary regarding the third reproach [click here]. We should give Our Lord the water of reparation for the offenses He receives, but instead we show ingratitude. We give Him gall and vinegar to drink. God favored the armies of the Hebrew people, and they defeated all the pagan Kings who occupied the Promised Land. The final and complete victory over those enemy Kings was achieved by King David, who established the Kingdom of Israel in its most glorious period. To achieve this, God worked many miracles and chastised those enemy Kings in a multitude of ways. That is, He struck down the heads of their enemies. "And you have struck My head with a reed..."
What was the retribution? Instead of exalting their God, Our Lord Jesus Christ, the Jewish people treated Him as a bandit. Even more, they struck His head with a reed. This kind of sin against the Sacred Head of Our Lord refers to the sins of the elites, the heads of the spiritual and temporal spheres. Are we part of the spiritual or temporal elites? How many times did we approve laws that were against Catholic principles? How many times did we cause scandal to our subordinates? Even if we are not among the elites, how many times did we approve those bad laws and scandals that came from above? Instead of protesting against such outrages, how many times were we silent so that we might indolently enjoy the good life? 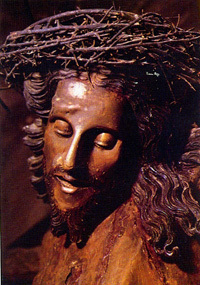 If we did such things or indifferently tolerated the offenses of others, we were striking Our Lord’s Head with a reed. Catholic principles should apply not only to some aspects of Religion, but to every facet of our spiritual and temporal life. Temporal society should be constructed upon those principles. Let us ask Our Lord to help us understand how to apply Catholic principles to temporal society and fight to implant them everywhere. This is the best reparation we can offer for our sins and omissions in this regard. And you have given to My Head a crown of thorns. The Jewish people were a mere tribe, not even a recognized nation. Because they were faithful to their vocation, God made them a great nation and a great people in the time of David and Solomon. They became respected everywhere. What did they do in retribution? When He came to them, instead of making Him their King, they despised Him. 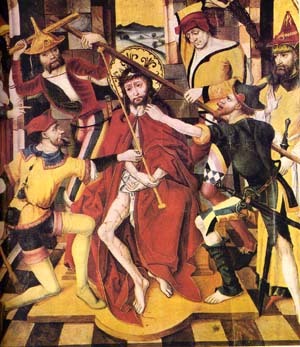 They gave Him a crown of thorns instead of a royal crown. "And you have given to My Head a crown of thorns..."
Again, this reproach is made with an implacable logic that offers no exit. But it is also an appeal to acknowledge the profound ingratitude offered in face of such Goodness, and to repent. 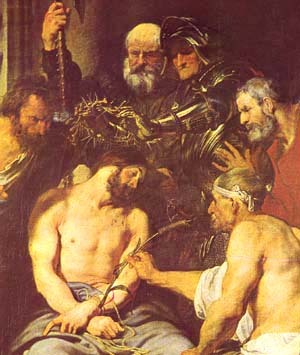 The suffering of the crowning of thorns is symbolic of the sins and ingratitude of those who have positions of authority or influence over others – parents, employers, and religious as well as temporal superiors. The heads of institutions must always take positions that glorify Our Lord Jesus Christ. If they do the opposite, they are crowning His Head with thorns. Those thorns are the bad orders each one of us has given or the bad influence we exerted over our subordinates. They should receive truth and goodness from us, but instead we induced them to follow error and influenced them to commit sins. Was I always a good parent? Or did I advise my children to follow the easier and more popular path that was a wrong one? How many times did I influence persons to follow the ways of the world rather than to fulfill their duties before God? Did I always teach my students adamantine Catholic doctrine, or did I teach what was more convenient for my career or to be popular? Each time that one of us influenced someone else to do bad things, we were crowning Our Lord with thorns. We should see this, repent of it, and make reparation for the evil done. And you raised Me on the scaffold of the Cross. The Jewish people came to hold a considerable degree of influence in several Empires of the Ancient World. Joseph and then Moses were chosen to be the equivalent of first ministers of the Pharaohs in the Egyptian Empire. Daniel was a personal adviser of Nabuchodonosor, monarch of the Babylonian Empire, and afterwards became the advisor of Cyrus, head of the Persian Empire. Esther married King Assuerus and became Queen of the Persians and Medes. These are just a few examples of the influence and power the Jews acquired through those who were faithful to God. But instead of acknowledging how God exalted them, the Jewish people raised Our Lord to the height of the Cross, exposing Him to general execration and derision. The elect Continent of the New Covenant was Europe. While it was faithful to Our Lord, Europe grew in power and influence until it became the light that illuminated the whole world. All its marvels were because God was with it. But how did Europe recompense all those privileges received? It was ungrateful. It created the Revolution to destroy Christendom. From then on, it marched inexorably to avoid Our Lord. Not content with destroying Christendom, the leaders of the Revolution pushed the same revolutionary errors into the Catholic Church in order to destroy her as well, if it were possible. That is to say, Europe crucified Our Lord again, as the Jews had done before. How many times have we collaborated with this destruction of Christendom in our own countries? As European descendants, how many times did we deny the inheritance of Christendom that we carry in our blood and souls? How many times by acts or omissions were we accomplices in the destruction of the Catholic Church by our adherence to the modernist and progressivist principles that direct this demolition? We should ask Our Lady to help us understand the magnitude of the consequences of our sins, and implore her to help us change our lives in order to please Our Lord and her on this earth so that we might be with them eternally in Heaven. These Reproaches of the Passion should make us very serious and arouse great compassion in us. But they should not create sensations of frustration and discouragement. Even if we are in a position of misery and guilt, from the height of the Cross Our Lord shows us His face of mercy. This is why the Church sings these Improperia during the ceremony of the Adoration of the Holy Cross. It is to invite us to repent and return to the right path. He is the God of Mercy. He has pity on us and wants us to be saved. Our Lord wants me to be with Him for all eternity. This is why He shed His Blood for me. 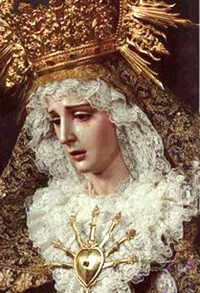 By the merits of His Holy Blood and the tears of Our Lady of Sorrows, we should ask for the grace to change our lives and be faithful to whatever they ask of us. Let us, then, end this meditation filled with compassion and hope.